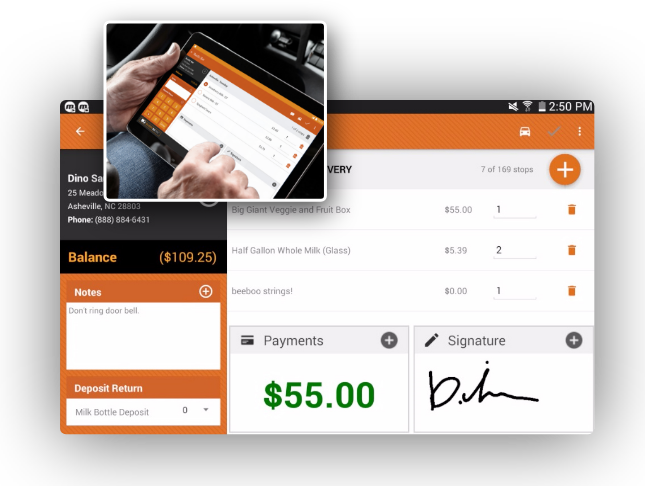 Make order changes on the road, collect signatures, get directions, email/print invoices, and so much more. Need to make changes on the road? Our native Android app will let you edit orders, returns deposits, take payments, skip deliveries, text customers, and get directions to the next waypoint all in a snap. Also a great tool for companies doing commercial/wholesale delivery. You can easily view some of the most important information at any time, right on your admin dashboard - stats like your sales this month vs. last month, new customers this month vs. last month, YTD sales, total outstanding, top routes, top products, top customers, and health of the system. Timeliness and order accuracy are vitally important for the reputation of your company. Whether you’re delivering milk, water, produce, meals, propane, or some other related product, your customers are depending on you to be there when you should and have the products they want. Our comprehensive routing software and delivery driver management software lets you edit orders, track outstanding returns, text customers a delivery confirmation, and more - all from your tablet or mobile device. Our list of features and functionality grows each month - that's the beauty of web-based software!